Home » What is Google Blogger? Q. What is Google Blogger ? You are enable to use blogger for everything from updating your friends and family about you and your life by giving your own advice on any topic you choose or you know. discussing your own view on a topic of interest. You can host your blog with multiple contributors or you can use on you own solo show. Setting up account on blogger is just few minutes of work as it takes 3 easy steps. Creating an account by filling up required information such as name, email etc., naming your blog, and choose template. After you done with these 3 steps you will be enable to create multiple blogs within that same account name. so, this setting up an account you need to do that part once. Blogger will host your blog for free of cost. This is why there are millions of bloggers are using blogger.com but the describing advantages as just a free hosting isn't enough as there are a lot of advantages to use blogger for blogging. Once you are done with setting up your blog with blogger.com, Blogger has a basic WYSIWYG (What you see is what you get) editor. This what bloggers like most. As there are many other blogging tools websites available in the web but they do not have robust html editors, and the ones that do often require java or other plug-ins. If you require more formatting options and a large window then you can use Google Docs in order to post to your blogger blog. Even You could also do advanced editing with HTML as it has an HTML tab that enables you to do it directly. 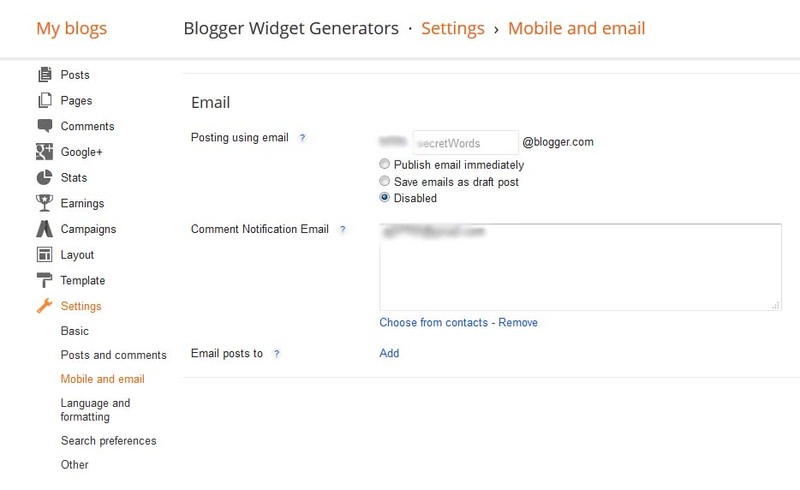 You are enable optionally configure blogger with a secret email address, so that you can post to your blog through email. This is an another feature of blogger for making updates on the fly or updating from your cell phone or other mobile device. Using blogger you are also enable to upload picture from your PC (Computer) and place it to your blog. You can choose the layout and size of the picture even there are numbers of options to do with your uploaded picture such as you can add caption to your picture, add title, add alter tags which can be useful in optimizing your blogger images for search engine. When you upload your pictures from your blogger post editor it will be uploaded and saved to the blogger's server space so that you do not need to use any third party websites to make it done. But that doesn't means that you cannot post the images you uploaded on other server, You can post any image from the web or from other server by help of HTML image tags. Also you can add videos on your blog posts ( Google Videos and YouTube video similarly be directly linked into your blog posts. ).